Oakhaven Hospice has been fortunate to be supported by The Beaverbrook Foundation in its quest to develop and expand our Hospice Neighbours project. This community based project helps those isolated by loss or illness with day to day activities that had previously been taken for granted. Simple activities like mowing the lawn, shopping, walking the dog or just popping in for chat and a cup of coffee is what our hospice neighbours programme is all about; the local community hospice supporting the local community when it most needs it. We were looking to source an income stream to fund this project and came up with the idea of the £100 Challenge. This is a very simple concept but one that had enormous potential to have an impact for the hospice, the community and the businesses and local oragnisations who took part. The primary aim of course was to raise funds for Oakhaven Hospice but the spin-off benefits for participants were not be overlooked. Participating local businesses and oragnisations were each “given” £100 and tasked with multiplying that sum by a minimum of 10 fold over a six month period by devising one or several fundraising ideas and bringing them to fruition, then donating the profit back to the hospice. As participants they are encouraged to be as creative and innovative as possible. It was a great way to show off entrepreneurial flare, bond with teammates and improve those organisational and communications skills, whilst all the time having fun and raising money for the Oakhaven Hospice Neighbours programme. 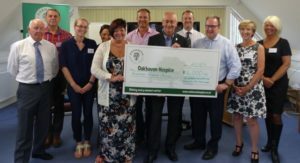 The project also helped bring the community together with local business fundraising and working together to the mutual benefit of Oakhaven which is so much a part of so many people’s lives. This exciting idea with so much income potential for our Neighbours Programme though would come at a cost, there were marketing and promotional materials to pull together, publicity and not least all those £100’s for the business taking part had to be sourced. That was when we pitched the idea to The Beaverbrook Foundation as a project they might like to fund. Knowing their preference for ‘pump-priming’ type projects that could go on to generate bigger bucks as a result of their investment they were certainly the right trust to approach. Fortunately they very much liked the project and agreed to fund it for its first three years. Recruiting began and the challenge was launched. Fourteen local companies were recruited and a mix of exciting, unique and innovative fundraising schemes launched after they were each presented with their investment money by Lord Beaverbrook at a special launch event. Six-months later and they were all back and we were delighted to be able to report that just over £14,000 had been raised; a very successful project and one that would not have got off the ground without the enthusiastic and valued support of The Beaverbrook Foundation to whom we extend our sincere thanks. Now onto year two when we are looking for twenty teams.